This might be seen as off-topic. But it isn’t really. To change the world you mainly need good ideas and hard work. But it also helps to have the right kind of tools. All Apple fans have probably seen this by now. 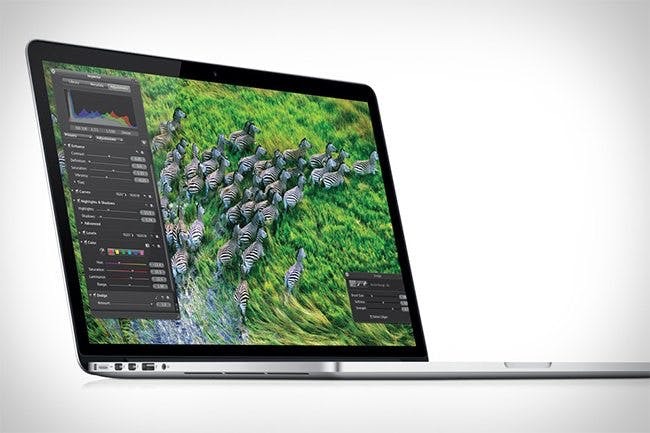 The new MacBook Pro with an insane 2880 x 1800 pixel Retina display. Faster and thinner than ever and with enormous amounts of flash storage instead of a hard drive. Perfect for editing HD video while traveling. I couldn’t help myself, I just ordered one. Are you jealous? Wow, hadn't seen that one. This will definitely be my next upgrade when I ditch my old macbook (not pro). I have a flash drive in my desktop computer and it makes an incredible difference for speed. I also have a retina display on my iPhone and iPad and the quality is stunning. Don't do that, stioupid doctor, this is a dangerously low fat machine ! No, I'm not jealous. Because I'm going to order one for myself. :-) Great great machine. Not jealous! I don't see the need for a 15" notebook - too big and bulky, no matter how thin. I truly think that 13" is the sweet spot for notebooks. I have a 13" Macbook Pro and almost sold it last week, in anticipation of a 13" retina display one, but Apple didn't offer one. My guess is that next year they will ditch the hard drives/current models completely and all will be retina. I'll buy one then. Truth be told - I use my Macbook Pro 13" for lots of stuff and love it, but I wish I would have bought an Air. The flash drive, better battery life, and lighter weight are the way to go. Yes, I am very jelly. Not jealous aside from the screen resolution. Needs a Bluray/DVD drive for what is costs. Wait in 2 years when you'll want to change the battery, then you can just buy a new laptop. It's the most service unfriendly computer to date: RAM is soldered and not extensible, batteries are glued in, even the SSD can not be changed as it is in proprietary format. The screen can not be good enough to compensate for that. Well, I don't think I'll be able to tell the difference between the screen on my iMac vs. the "retina" display on the new macbook pros unless I sit reeeally close to my computer screen, which I don't think is going to be happening any time soon. 2 grand for a laptop is just too expensive for most people (not saying that a lot of people won't buy it, just that most people can't afford it). Nope, not at all because I don't like crapples products. I don't like how they treat there consumers with locking them down with out ways to upgrade or replace parts easily. I'll stick to a Window Computers that I can do things with thanks, but I'm happy your happy.